Local residents who haven’t read the Inspectors’ report [PDF 590 pages] may be wondering what impact the trench is going to have on them. The answer, at least for those who live to the east of Truleigh Manor Farm, appears to be “not a lot”. The main construction compound for the entire trench will be at the side of Edburton Road (page 153) and about 100m x 50m in size (page 159). The report itself does not show exactly where this compound will be located but it seems safe to assume that it will be very close to the point where the trench intersects the road (see above). 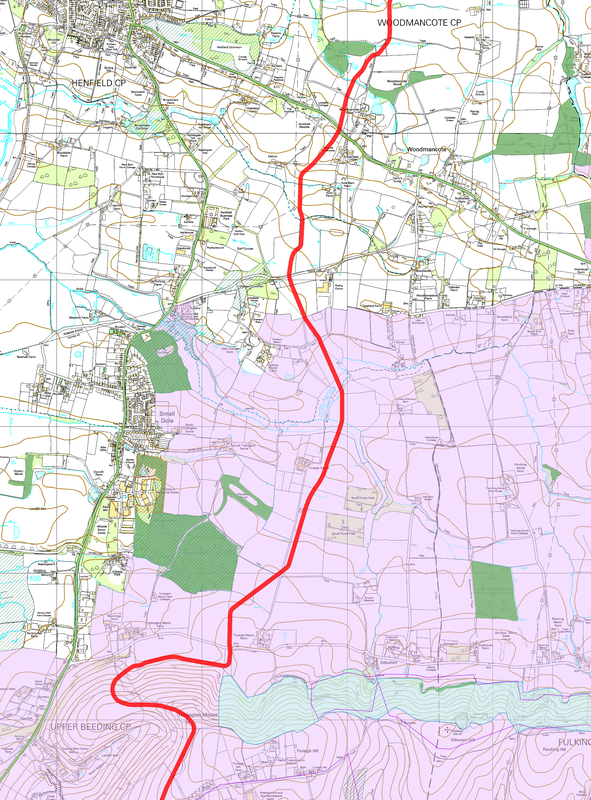 Given the route that the trench will take, the main works traffic from this compound will use the A2037 rather than coming through Fulking and Poynings. There will be some temporary disruption to Horn Lane and to the A281 in Woodmancote when the trench is cut across them. Readers of the report [PDF] cannot help but notice that the inspectors were much exercised by Tottington Mount. It is discussed or referenced on no fewer than 32 pages. By contrast, there isn’t a single reference to Truleigh Hill anywhere. Tottington Mount lies between the Truleigh Hill Youth Hostel and Tottington Manor Farm. There is a public footpath opposite the farm that will take you up and across the mount. It is extremely steep for much of the route. Apart from the splendid view to the north, there’s not much to see. You will pass a long low earthwork as you near the summit. The mount itself just looks like canonical downland to an inexpert eye. As the map above indicates, the trench will bisect the mount. Tottington Mount is a virgin patch of Downs that has never been ploughed. As a consequence, it hosts noteworthy plant species (page 57). The works area for the trench is to narrow from 30-40 metres to 20-30 metres as it cuts across the area (page 94). 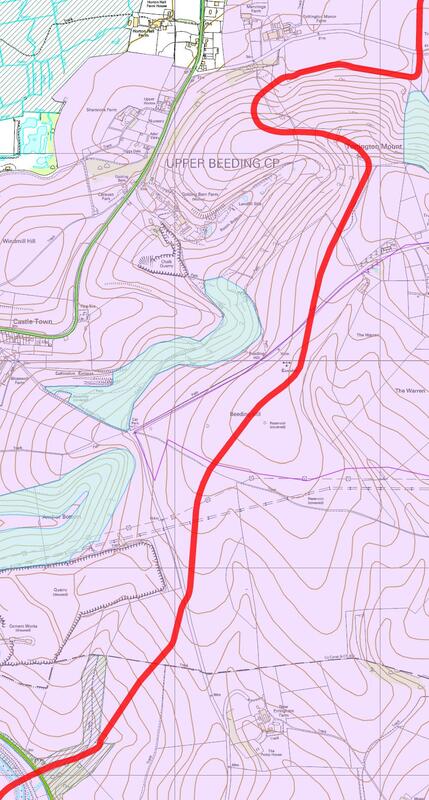 E.ON will be spending £330K on bog matting and other mitigation expenses on this small section of the trench (page 38). Some details of the mitigation plans, and the SDNPA’s scepticism about them, can be found on pages 57-58. The inspectors think that these mitigation efforts may well fail (page 41). 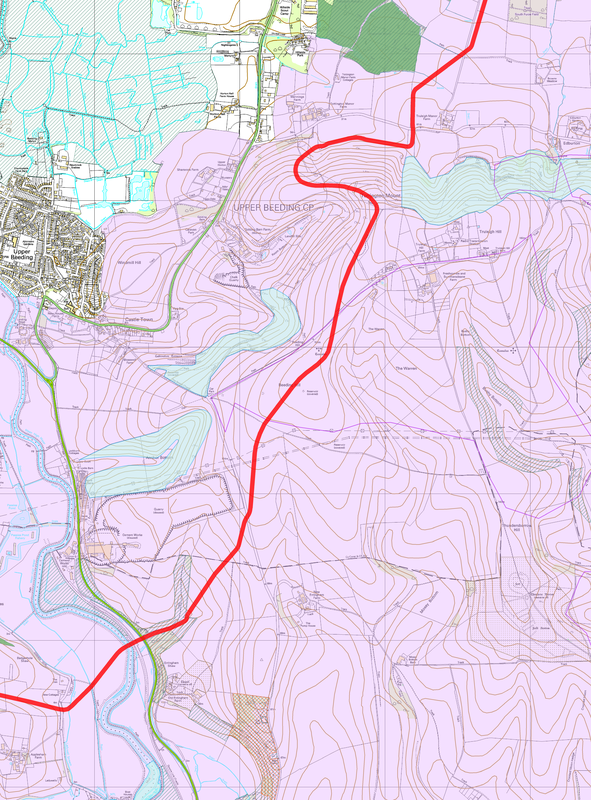 The trench will skirt the Beeding Hill to Newtimber Hill SSSI (Site of Special Scientific Interest) with a margin of about 50 yards at Tottington Mount. Disturbance to the chalk grassland species living within the SSSI will be ‘negligible’, apparently. Indeed, these species are set to benefit significantly from all the environmental monitoring that will be happening at Tottington Mount as part of the mitigation exercise (pages 52-53). However, Adonis Blue caterpillars may not share this upbeat view — they risk losing their lunch (pages 67-68). The earthwork is a Bronze Age cross dyke and is listed as an ancient monument. The trench will go right through it (click the map above to see the detail of this), something that English Heritage refers to as a “substantial harmful effect” (page 178). The good news is that archaeologists will be funded to root around in the rubble — “appropriate archaeological supervision” (page 179, pages 398-399) — and English Heritage felt able to rule that “the harm is necessary in order to deliver substantial public benefits that outweigh the harm” (page 178). In turn, the inspectors concluded that there will be “be no loss of significance of any designated or undesignated heritage asset” (page 182) notwithstanding the “risk of adverse effects upon heritage assets, including the Tottington Mount Scheduled Ancient Monument” (page 227). Updated 12th August 2014, 17th July 2015.